KIEV: As a comedian, TV host and actor, Volodymyr Zelenskiy knows how to start a show with a bang. He proved that by beating all comers in the first round of Ukraine’s presidential election. As he plans for the grand finale, a run-off against President Petro Poroshenko on April 21, aides say he is sticking to an unorthodox campaign routine that has torn up the play book. Poroshenko responded with a much more sober video in which he accepted Zelenskiy’s condition of holding the debate in a huge soccer stadium. But he cautioned: “Debate is not a show … This is no time to joke around. Being a president and commander in chief is not a game.” Zelenskiy’s response to Poroshenko offered a snapshot of how he has upstaged his more experienced rivals, winning nearly twice as many votes as Poroshenko in the first round of the election on March 31. At stake is the leadership of a country on the front line of the West’s standoff with Russia following the 2014 annexation of the Crimea peninsula and war in eastern Ukraine against Russia-backed separatists in which 13,000 people have been killed. “All that we do is to not be like everyone else,” said 28-year-old Michael Fedorov, whose team manages various Facebook, YouTube and Instagram pages. “We do not want to write typical posts. We do not want to speak the words that all politicians use. We want to get away from this as much as possible.” He said Zelenskiy had from the start opposed traditional ways of doing things. “As a result, we have one platform only that’s the internet,” he said. Hoping a high turnout will favour Zelenskiy, his team is trying to ensure younger voters cast their ballots in email messages with headlines likely to make them click and read. When former Prime Minister Yulia Tymoshenko, who was eliminated in the first round of voting, posted a video of herself eating a hot dog at a popular gas station chain to show her common touch, Zelenskiy posted a picture of himself and his team eating a hot dog at the same chain. 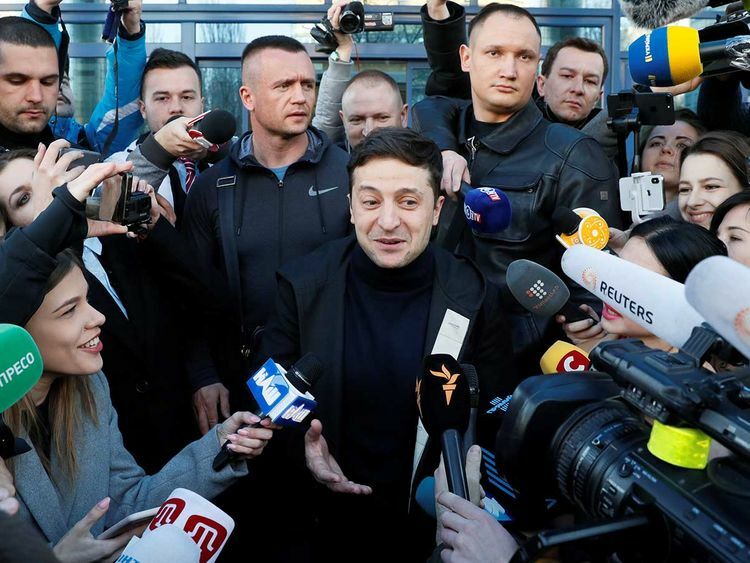 Zelenskiy has been accused during the campaign of being the puppet of a rich businessman whose TV channel airs his shows. Zelenskiy and the oligarch deny this, and both say their relationship is purely professional.